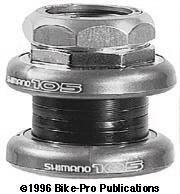 This is one of Shimano's new for 1994 "cartridge bearing" headsets. Let's say again from the outset these "cartridge" bearings are not of the type we describe in more expensive headsets, those we refer to as sealed cartridge bearings, and they are mechanical little marvels which these attempt to impersonate at a price. The DA cartridge bearings have ball bearings placed between interlocking steel races. The joined steel pieces enclosing the ball bearings give the "cartridge" the appearance of an oversized, common, steel cage, bearing retainer, with a concave (cupped) interior and a convex (rounded/arched) exterior. The "cartridge" has a squat, conical appearance. In looking at the bearings that arrive with Dura-Ace 7410 and the Ultegra 6500 headset they appear to be the same, and have the same exact weights, because the interior of the bearings can't be seen, it must be assumed, and it's safe to say, they are identical. So to make the evaluation of whether to get the 7410 or the 6500 becomes more difficult, if bearing quality isn't, (and it should be), the determining factor. The 7410 weighs 102.5 grams, while the Ultegra 6500 weighs 110 grams. If you substitute the fork cone race, which is made of steel from the Ultegra 6500 headset for the aluminum that comes with the Dura-Ace 7410 model, the Dura-Ace will weigh the same 110 grams as the Ultegra. There are also small differences in the stem seal of the head lock nut. Using anything less than a microscope, it is impossible to tell the differences between the three major aluminum pieces, (the cups, and the upper cone race), of the Dura-Ace and Ultegra models. The DA headlock nut is made of forged aluminum, that is barrel polished to smooth all edges, then tapped with threads for the fork steerer. There is an O-ring positioned inside at the top of the headlock for a stem seal. The head key is made of plate steel that is 1.97mm thick and identical to the Ultegra head key washer. Below the washer is the upper cone race, which generally would be the upper cup but the cartridge bearing use makes it necessarily a cone race. This upper cone race and its matching upper cup are made of forged aluminum. When the bearing is properly placed in the bearing assembly, there is a .8mm gap between the two aluminum parts. This gap, though it looks odd, and is clearly untidy, occurs in an area of the cartridge that is well sealed. The lower cup and cone race are made of forged aluminum with very light machining. A tiny gap occurs at the bottom of the cup, again in a protected area. The 7410 is Silver, to fit 1" diameter fork steerers, and has a weight of 102.5 grams. This is the deal of a lifetime, if you even casually considered the Dura-Ace 7410 cartridge model. 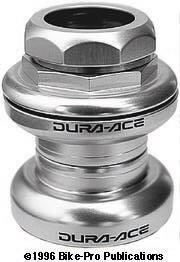 (Read the review of the Dura-Ace 7410 model) The differences between the two appear only to be the Ultegra's steel fork crown race, small changes in the headlock nut and the printed name on the side. If you can live with steel crown race, you probably won't notice the headlock differences, and a small amount of lacquer thinner wiped over the name will remove it and no one will know. The headlock nut is made of forged, then lightly machined aluminum. Its stem seal is made of hard Black plastic. The head key washer, aluminum cups, cartridge bearings, and upper cone race which are described in the 7410 review. The fork crown race is made of Black machined steel, this is the single component that makes the weight difference between the 7410 and the 6500. The HP-6500 Ultegra headset is for 1" diameter forks, is Silver in color and has a weight of 110 grams. The 105SC headset is made using steel pieces and an aluminum alloy head lock nut. The head lock nut is silver cast aluminum which is then threaded, with a snap in plastic stem seal. The upper race is cast and threaded steel with a recess for the stamped, silver colored, steel head key washer to make the headset loosening up more difficult. 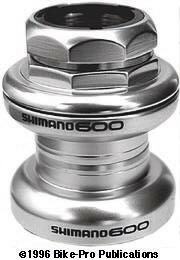 Shimano gives the bearing cups their silver color by enclosing the cup in silver colored plastic. The upper cone race is cast steel with a ground bearing surface that is then painted Black. The fork crown race is cast steel with a ground bearing surface. The 105SC has snap in dust seals located under the bearing cups to protect the bearings against contamination. The two steel bearing retainers each have twenty 4mm ball bearings. This Road Racing headset is made in the 1" size only, has a weight of 116.5 grams, with a stack height of 32.7mm and uses a 32mm headset wrench to tighten both the upper cup and head lock nut.